For $48,500, those are some pretty nifty Scirocco taillights. Whether you are Mr. Bond, or Mr. Bean, the Aston Martin has always been a ride of choice for the well heeled Brit. 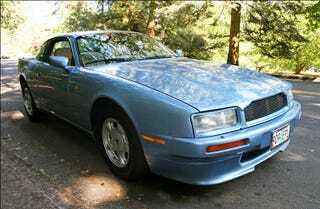 Today's Nice Price or Crack Pipe 1991 Virage could be your choice, but will its price make it more of a mirage? Fully 88% of you wished yesterday's Bentravisty had been a mirage, but sadly it was the real deal. Real that is in the sense that it existed at all, as there was nothing really Bentley about that Town Car-toon Crewe wagon, and hence it garnered a deserved Crack pipe loss. That result proved two things - it's still hard out here for a pimp, and that Florida is home to the most whacked car deals around. It must be the humidity. It never gets that humid in England, although it can get pretty damn damp outside. The 330-bhp of today's veddy English 1991 Aston Martin Virage may make you break out in a cold sweat, so you might want to bring a towel so as not to ruin the Connolly hides on its insides. The precedent V8 served as Aston's Raison d'être for fully two decades making the debut of a new model as rare an event as the Queen doing body shots of Guinness. The Virage's coming out party was the '88 Birmingham Motor Show, and the car's rounded and tapered design - penned by John Heffernan and Ken Greeley - provided a modern take on the traditional Aston long-hood and short-deck meme. That appearance caused the uninitiated and the dense to confuse the earlier V8 cars with Ford's Mustang, and in a weird bit of coincidence, the House of the Blue Oval up bought Aston right before the Virage hit the scene. This metallic blue over white '91 is but one of only 365 cars constructed by the tenuously existent constructor, although sadly it's not one of the 50 that were fitted with ZF's five speed manual. Oops, bye haters! Instead, backing up the 32-valve 5.3-litre V8 is a Chrysler Torqueflite 3-speed with a very traditional wood and leather console-mounted lever. With over 360 lb-ft of torques, three speeds should be plenty, and in fact contemporary tests of these cars praised their locomotive like acceleration which never seemed to run out. All that power is managed by a chassis that's more happy eating up the miles than the corners. At 3,950-lbs, the big coupe is very much a GT, and the switch from the De Dion rear end of the precedent V8 to a more traditional IRS setup meant that the car proved cumbersome in the corners. Still, the big hand-built V8 sounds like nothing else. Outside, this Virage appears as-new which means it might still carry the fingerprints of the panel beaters who shaped its lovely aluminum body inside. Up in front, bookending the traditional Aston grille are a pair of somewhat soulless eyes taken from Audi's 200 sedan, while around back the second -generation Scirocco tail lamps remain obvious adoptees. The silver five-spoke alloys are factory correct, and look well balanced in the subtly arched wheel wells. Inside, there's more OPP as the steering column comes from the GM parts bin while most of the switchgear is Ford. Somewhat alarmingly, considering the source's record of electrical reliability, the climate controls come form Jag. The rest of the interior is simply gorgeous, awash in burled walnut and enough dead cow to require a bovine grief counselor. The styling is very traditional, and seating here is offered for four, although the two rear passengers do get the short end of the seating stick. The Oregon dealer is short on the details here, describing the car as being low-mileage, but neglecting to mention exactly how low. The car is a U.S. factory offering, so no monkey business with registration should be required outside of potentially California, which always marches to a different drummer when it comes to what you can drive here. Should someone want to take advantage of this rare opportunity they'll have to come up with some serious bank. The dealer is asking $48,500 for this Virage, and as there aren't a lot of them trading hands here in the U.S. that's a number that's hard to benchmark. Earlier V8s are even more rare, and more dear, while the later - DB 7, 9 and all have been produced in numbers that exceed the quantity of all previous AMs built in total, so none of the equatable models will be as unique as this one. What do you think about that price, does $48,500 make this a bargain Brit? Or, is that price beyond even a double-oh's reach? sportscarshop or go here if the ad disappears.